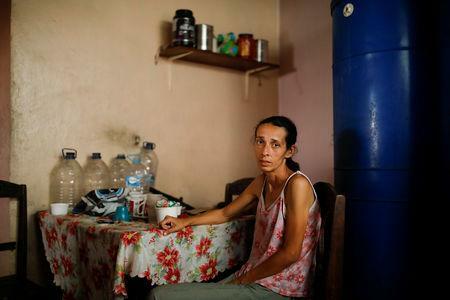 CARACAS (Reuters) - Yaneidi Guzman has lost a third of her weight over the past three years as Venezuela's economic collapse made food unaffordable and she now hopes the opposition will succeed in bringing urgently needed foreign aid to the South American country. 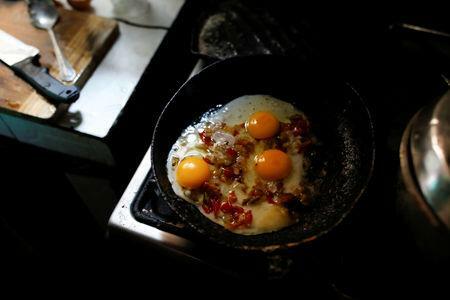 Venezuelans' diets have become ever more deficient in vitamins and protein, as currency controls restrict food imports and salaries fail to keep apace with inflation that is now above 2 million percent annually. Growing malnutrition is one of the reasons Venezuela's opposition leader Juan Guaido has moved ahead with his plans to bring supplies of food and medicine into Venezuela by land and sea on Saturday, despite resistance from Maduro. Maduro, who denies there is a humanitarian crisis, has said it is a "show" to undermine him. On Thursday, crowds cheered as Guaido led a convoy of opposition lawmakers out of Caracas on a 800-km (500 mile) trip to the Colombian border where they hope to receive food and medicine. Guaido has not provided details on how they would bring in the aid. In response, Maduro denounced the aid, saying in televised comments that he was considering closing the border with Colombia and would close the border with Brazil. Aid has become a proxy war in a battle for control of Venezuela, after Guaido in January invoked a constitutional provision to assume an interim presidency, saying Maduro's re-election last year was fraudulent. "I hope they let the aid in," said Guzman, who despite holding down two jobs cannot make enough money for the tests, supplements or protein-rich diet that doctors have prescribed her. She and her husband make less than $30 per month and prioritize feeding their three young children. While there is a vacuum of government information, almost two-thirds of Venezuelans surveyed in a university study called, "Survey on life conditions," and published last year, said they had lost on average 11 kilograms (24 lbs) in body weight in 2017. On the wall of Guzman’s home in the poor hillside district of Petare in the capital Caracas, hangs a wooden plaque with the psalm "The Lord is my shepherd, I lack nothing." Yet her fridge is empty except for a few bags of beans. Sometimes she wakes up not knowing what she will feed her family that day. Mostly they eat rice, lentils and cassava. While Guzman says she would welcome the aid, she is concerned the one-off shipment would be a drop in an ocean given Venezuelans' needs. "You don't only eat once," she said. Some political analysts say Saturday's showdown is less about solving Venezuela's needs and more about testing the military's loyalty towards Maduro, by daring it to turn the aid away. Some aid agencies like Catholic relief agency Caritas are already on the ground providing what help they can. In San Francisco de Yare, a town 70 km (45 miles) south of Caracas, Maria Guitia's one-year-old baby's belly is distended and his arms thin. The pair live with Guitia's five siblings and parents in a one-room tin shed with a dirt floor and no running water. Work is scarce and they live off payments for odd jobs and a monthly government handout of heavily-subsidized basic food supplies. They have taken to inventing meals with what little they have like lentils with plantain from the trees in their backyard. Guitia, 21, said her son had lost weight over the past five months until Caritas gave them some nutritional supplements. The United Nations and Red Cross have cautioned against the politicization of aid. The United States, which is pushing Maduro to step down, sent aid for Venezuela to a collection point in neighboring Colombia in military aircraft, in a show of force. Guzman dreams of living once more not off foreign aid or government handouts but her own work. "It's not that I want to be rich, or a millionaire," she said. "But I do want to give my children a good future, to make sure I can take them to the doctors when they get ill ... and that they eat well."